Note: To play the song clips you will need a media player that plays MP3 music files. If you don't have one, a FREE download is offered at the Windows Media Player website: click here. *Click here to purchase the CD! *The CD entitled "Nvda Sunalei" is out-of-print. It has been re-mastered, and the song Sacred Fire has been added. 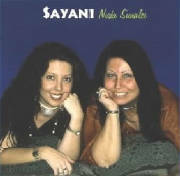 "Sacred Fire" is the new album title, and is available for purchase in the Sayani Store.